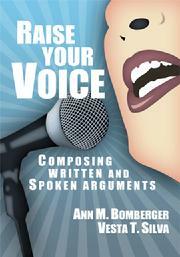 "Raise Your Voice is a simple, thorough and direct introduction to writing and speaking as arguments, and it is the most elegant text I have read on the topic. The text speaks directly to the student with its use of second person, outstanding examples of rhetorical situations, pithy quotations about strong communication, numerous technology tips, and great images. "Bomberger and Silva demystify the processes, planning, and production of texts in a way that speaks directly to the student, with the instructor free to listen in. The parts of rhetoric for which professors have specialized jargon are explained without the intimidating terminology and from the point of view of the user, a student who needs to solve communication problems across disciplines and genres. "Demystifying communication is the most important mission of anyone who teaches first-year composition or speech. Raise Your Voice does that job. I plan to use this book with my students." Ann Bomberger, Ph.D., is an Assistant Professor of English at Gannon University where she teaches courses in Composition and African American literature. Her previous work has been published in Computers and Composition, Women's Studies, and Southern Literary Journal. She won Gannon’s award for Excellence in Using Technology in the classroom. Vesta Silva, Ph.D., is an Associate Professor of Communication Arts and the Director of Speech at Allegheny College. Silva provides professional development for faculty teaching in Allegheny’s FS program (a required three semester course sequence focused on writing and speaking proficiencies). Silva also directs the Speech Center, which provides student peer speech mentoring as part of Allegheny's Learning Commons. Her previous work has appeared in Communication and Critical/Cultural Studies, Communication Theory, and the Journal of Communication Inquiry.